Goldilocks has done more than just break Baby Bear’s chair and eat his porridge! She has hidden several items as well. 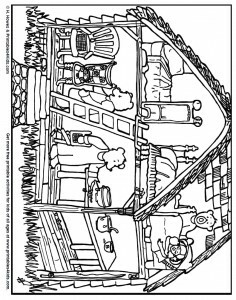 Can you find Mama Bear’s nightgown, toothbrush, and purse? Help Papa Bear find his watch, bow tie, fishing pole, and glasses? What has she done with Baby Bear’s baseball, toy truck, sock, banana, baseball bat, and spoon? Color the picture and circle the missing items! Shh…don’t wake Goldilocks while you’re searching! This hidden pictures worksheet is the perfect supplementary activity for teachers, homeschool or just preschool story time with Mom or Dad.